A recent study highlighting the renewable energy capacity of the eastern power grid found adding new transmission capacity can help further cut costs and emissions. In a recent report, the National Renewable Energy Laboratory (NREL) found the grid serving the eastern half of the U.S. is technically capable of integrating enough wind and solar power into the system to meet 30 percent of the region’s yearly energy needs. But one major obstacle to the large-scale use of renewables remains: getting the best wind resource from the Midwest to the East, where the power is needed. Continue reading. 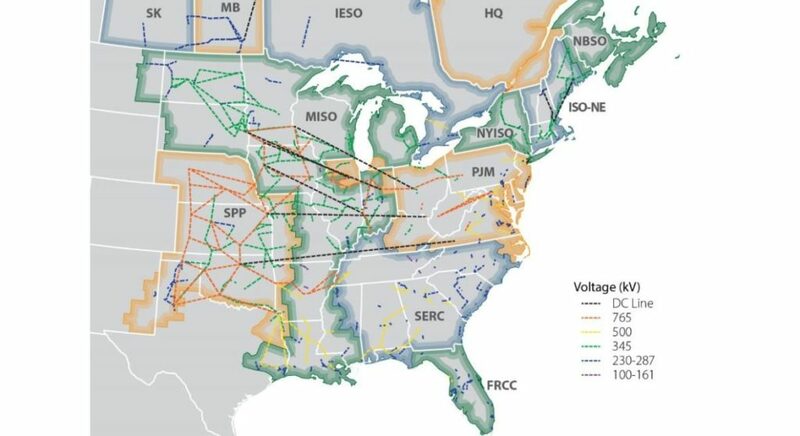 This map from the National Renewable Energy Laboratory’s recent modeling of the eastern grid’s renewable energy potential predicts six high-voltage DC lines (dark dashes) carrying wind power from the Great Plains eastward. This entry was posted in Nebraska / Midwest News, NewsBlog and tagged Electric Co-op Today (ECT), Midwest Energy News, National Renewable Energy Laboratory (NREL), Nebraskans for Solar, Solar Energy Industries Association (SEIA) on September 7, 2016 by Helen Deffenbacher.